Recommendations of friends and acquaintances has, and always will, hold great weight when it comes to making purchase decisions. No wonder those smart marketers, who were around before I was even a glimmer in my parents’ eye, saw (and continue to see) benefit in using customer testimonials. Of course, the social web took this concept to a whole new level. Why should we be limited to just our immediate circle of “real life” friends, when there’s a whole world of people out there who can share their experiences, be it good or bad. And regardless of how much you trust Joe Bloggs’ opinion from Twitter vs. your own brother, it’s more about having access to a wider network of people and information so you can form your own judgments when it comes to different products and services on offer. It’s fair to say that review sites are now as common as muck. Many people (myself included) will often never make a big purchase decision without checking out online ratings and reviews first. But what if a site didn’t allow negative reviews? Or made it as difficult as possible for a reviewer to post a negative review? It’s 2011, not 2001. So surely such practices no longer exist? Step forward, puppyfind.com — a site that claims visitors can find the perfect puppy at the click of a mouse, yet doesn’t allow visitors to know any ugly truths about the sellers. A friend of mine recently submitted a review of a bad experience she had with one of the sellers (B and T Canine Corral) that appears on puppyfind.com. Prior to her review, there was only one other glowing (yet very suspect) review, which did not match up to the first hand experience my compadre had. Below is a copy of the documentation request email that was sent to you on 3/30/2011. Please note that documentation must be received by 4/12/2011. This is to inform you that Puppyfind.com has received a request to remove the review you submitted on: 3/15/2011 for seller: B and T Canine Corrals as an invalid review. 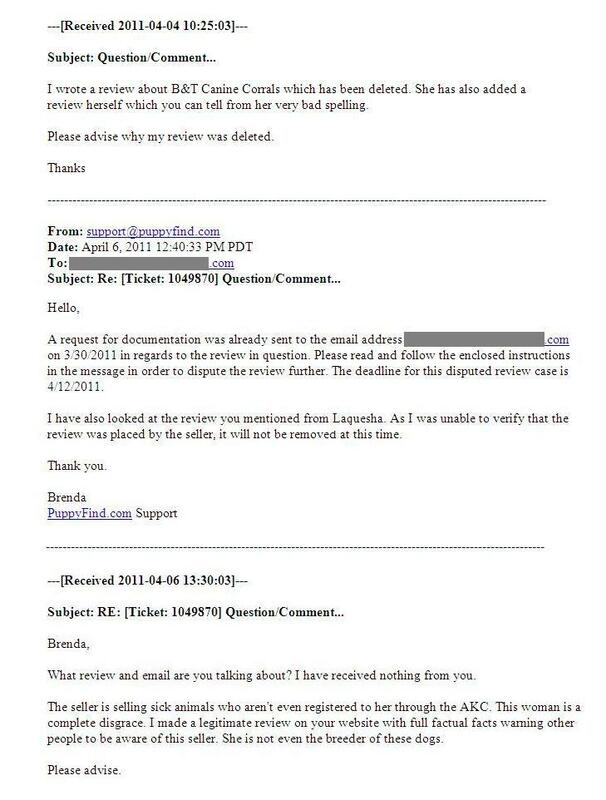 The review in question is currently hidden from public view while we proceed with the disputed review process. If you wish this review to once again be visible to the public, please respond with the details of your complaint along with any supporting documentation you may have. This documentation could include Vet reports, copies of email communication between you and the Seller, contracts, guarantees, etc. If your review is in regards to a medical issue, a written statement from your vet is suggested. You can fax this information to 1-480-629-8020 Attention: Quality Management, Case #272594-4736309. Please be sure to also include your name and the email address you used on our site. We also request that you include a phone number where we can reach you if questions arise regarding the documentation provided. Please note: Your information will need to be provided to the breeder in question to allow them the ability to formulate a proper response and/or contact you to resolve this dispute. If this is a problem and you do not wish to let the seller know who you are, I will be unable to continue with the review process. If no response is received from you within 2 weeks from the date of this notice, we will assume that the review you submitted is no longer valid and will allow it to remain deactivated. Reviews are handled Monday through Friday 8am-4pm MST, excluding holidays. Oh Brenda. I have so many problems with this Email, on so many levels, I don’t even know where to start. But in the end, and I think you’d agree, it comes down to principle. Just because a review is negative does not make it “invalid”. And just because the seller on your site doesn’t like it, does not give them the right to get it taken off (even if they are paying you a service fee). When was the last time you had to prove that the dirty diner down the road, with the rude waitress and awful food was the worst restaurant you ever went to? Or that Gigli deserved those 153 Rotten Tomatoes? Well puppyfind.com, you’ve lost all ounce of credibility where I am concerned. You may be able to blind visitors on your own site, but yours isn’t the only outlet for communication, and the quicker you realize this the better. In the end, the truth will out. And just for the hell of it, here’s that review my friend posted about B and T Canine Corral; the one that you didn’t want people to see just because it wasn’t all unicorns and glitter. I don’t think my friend should waste any more time going through your antiquated process. It’s 2011. Get with it. “I’ve had dealings with this breeder [B and T Canine Corral] in the past and would not recommend her to anyone. In my experience, this breeder (though calling her a “breeder” is questionable in itself) is more like a glorified puppy mill. My dog arrived sick, and the breeder showed no regard for the animal’s welfare at all. The AKC registration I received wasn’t even under the “breeder’s” name. It seems that money is her only motivation and she cares little about the animals she is selling. Avoid the heartache I went through, and avoid her at all costs”. If puppyfinder was really acting in the interests if buyers then they would let the review remain online. Obviously they are nothing more than an eMarketplace for sellers and if they were being honest should make this 100% clear to users if the site. Why don’t they give the seller an opportunity of a published right of reply as on eBay? In an intelligent informed marketplace that would enable potential buyers the opportunity to make their own judgement. I agree with you Andy. In fact, they just removed a comment I left on their site, without even notifying me about it’s removal. And in its place? Another positive review from someone (“breeder” from B and T Canine Corrals) trying to game the system. How truly sad. This goes against the very reason that reviews are even shown on websites, to get honest reviews. The fact that puppyfinder.com is completely dishonest will come back to bite them in the end. Thank you for posting this on here. I was looking at a puppy from B and T Canine Corrals and am glad I found this. You saved me a lot of trouble dealing with them, so thank you!! Thanks for your feedback, Stefanie! I’m also glad you escaped the B and T Canine Corrals experience. I am so thankful to have come across this posting. I was literally discussing payment terms with this “breeder”. I’m still in the market for a sheltie, but I will purchase from someone that loves their puppies as much as I’m going to. Thanks!! April – this is so good to know. Thanks for sharing. Continue doing your research to find a reputable breeder. It will be worth it. B and T canine sold us a sick dog. We had it a week and it died of coccidia!!!! Dr said it comes from kennels and their mother!!!! All she said was I’m sorry!!!! This place is a joke!! We purchased a dog at this kennel and it died in one week with coccidia. Which the dog cost us 600 plus 400 vet bill!!!! All she could do is day Sorry!!!! This place needs to be reported!!! ASAP!!!!! She told us we could buy another one !!!!! DONT THINK SO!!! I’m really sorry to hear that, Darla. It’s unbelievable that places like this continue to be in business. I might suggest not using Puppyfind or this breeder. I also purchased a puppy from this breeder and he was sick. (Could explain the pill she shoved down his throat for the runs before I left with him?) He had Coccidia, luckily he was off to the vet ASAP. He got better after about a week and was fine. Dog $1700, if memory serves, Vet bills because he was sick, change of food etc, Thank god he got well, It is my understanding that the immunity comes from the mother not the disease whoever posted that earlier. When they are very young. She must have some wicked strain of it there at her kennels is all I can say. I couldnt agree more. We my husband and I arrived from a great distance to pick our puppy. She coughed as she came out of the holding pen. I then noticed she had been treated for a navel hernia. I was not advised of this before our long trip. She also had cocidia. She was treated for cocidia, kennel cough. We are still fighting the kennel cough and picked her up 3/25/2012. I also gave her a check for $50.00 for the id chip that was implanted which was suppose to be transferred to us. Sent her an email. Said she would get in touch with them. I haven’t heard a word. She is running a puppy mill and has no conscious. Building a huge home on the backs of mother dogs. It’s a disgrace. I refuse to leave feedback because I know it will be deleted. So I am posting here. Lucky to find this website. I wish USDA and AKC would shut her down, but of course they won’t making to much money from the buyers. It’s disgusting behavior. Bipedal Pigs…should be the name of her kennel’s. So far, every single person I’ve seen, for the past three years, Their puppies left with Coccidia. Are they not inspected? Sounds like they need a few complaints. Those you can’t remove. Also BBB..you can’t remove those either. Blog and complain to the right people. It’s about all you can do. My vet checked the meds she gives and the one she givesfor coccidia is actually used for cattle. it is very cheap, he said there are seminars where breeders are learning about this so they can save money. The french bull dog I bought from her is so large she looks like a mid size boxer. She is tall and thin she has no bulk. I plan on doing a DNA thru AKC and find out if she is infact a pure bred Frenchy. Again she should be shut down. I should have learned my lesson. But as a baby she was what I was looking for. Shame on me and certainly shame on her. I am so sorry. The bad thing in all this is we get so attached to them. She certainly does need to be shut down. Unfortunately most states these days?..dog breeding falls under the USDA, like cattle. Please beware, there’s another breeder in Missouri that has set up a Frenchie “rescue” and is culling out her puppy mill dogs by rehoming them with an absurd fee in the Missouri/Ark/Oklahoma area, and sorry to say if it’s done online, there are no laws to stop them. So please beware. And NEVER purchase a puppy online. And do through checking of all puppy rescue organizations. Will’s FB page has her info. So does the FBRN. Puppyfind removes customer complaints about the breeder at the breeders request. Therefore, it might look like a breeder has a 5 star rating, but in reality they could have many negative complaints against them. Puppyfind.com should allow customers to post (and keep posted!) ratings and comments about their experiences with a breeder. Removing comments is not ethical of Puppyfind because you really don’t know who you are dealing with or how many people that have scammed in the past. I am so sorry for anyone who has been led to believe they are purchasing a puppy from a good breeder due to Puppyfind.com ‘s dishonesty. Well said! I would not be surprised if a lot of those 5 star ratings come from the breeder themselves. Puppyfind are totally misleading buyers which is wrong. I suggest we start our own website that rates sites such as Puppyfind, etc. Which is nothing more than a glorified dog broker for mills. Don’t just limit yourself to that genre. There’s loads out there that deserve to be “looked at”. I had the same experience with PuppyFind. They removed my accurate and unbiased review of a breeder. I spent lots of time sending them documentation from our Veterinarian, they told me that I had to remove a lot of the information in my review, but I just posted the updated review tonight…we’ll see how long it stays up there! If they only want positive reviews posted on their website, then they should say so. « How do you Scale PPC Reseller Programs?